Wellpoint systems are broadly used and recognized in the construction of drainage systems for building trenches/excavations. This is due to needs dictated by local hydrogeological conditions and the usable value of these drainage inlets. 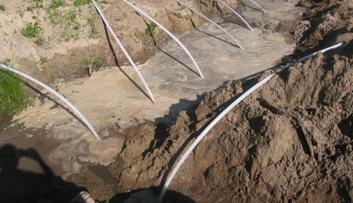 Wellpoint systems are designed for draining fine-grained soils, which do not give water easily. Their characteristic feature is a system of densely spaced inlets with small cross-sections, connected in parallel via a suction header pipe with a pumping engine. Wellpoints are vacuum inlets/intakes. Operation in negative pressure conditions requires that the wellpoint system be maximally leaktight, and that pumping engines be able to generate high negative pressure and to receive a considerable volume of air coming from the soil through inlet filters. The IgE-81 system is a subject solution for drainage, developed by Polish scientists. Due to its engineering and operational advantages, it has a leading position among other solutions used by Polish contractors. The IgE-81 wellpoint systems are designed to drain building trenches and excavations in low and medium permeability soils (permeability coefficient k <40m/day). The system may be used as an independent installation or a support system for other drainage inlet types in one- or two-level arrangements. 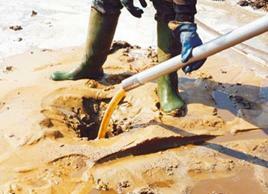 One wellpoint level makes it possible to lower the ground water table up to 4 m, and two levels, up to 7 m.
The IgE-81 wellpoints are fitted to work without sand filling; sand filling shall be used only in interbedded or dusty soils. Depending on ground water inflow conditions, trench size and the pumping equipment at disposal, the quantity of wellpoints connected to the appropriate pumping engine varies from 5 to 150 pieces. The most commonly used systems are based on 50-100 wellpoints. The main element limiting the quantity of wellpoints connected to a single pumping engine is the volume of air and water that penetrates into the system through inlet filters, and which has to be delivered by the pumping engine. Pumping engines characterised by a limited air uptake capacity may be used as substitutes, reducing the quantity of wellpoints connected to them. § two casing pipe types in two lengths, added to the set, which make it easier to install wellpoints in different soil conditions and at any depth. Wellpoint systems are available in two versions: IgE 81/32 and IgE 81/63. Both versions differ from each other above all in the wellpoints that are used. The most commonly used version, IGE 81/32, is based on flexible wellpoints, 32 mm in diameter. In the case of the IGE 81/63 option, diameter 63 wellpoints are used. This version allows for more efficient drainage. As compared to version IGE 81/32, a flexible connector with gaskets is additionally required for each wellpoint in order to connect it to the suction header pipe. Also, the suction header and the stoppers that close its ferrules are different. All metal elements of the system are made of aluminium. Pump flanged, coupling joint - (item 1 on the list) has a flange on one end, and on the other a tip with an inside fitting 133 (V-type – male end). The ferrule is an element used for quick connection of the pumping engine to the wellpoint system suction header pipe and discharge pipe. It should be permanently screwed down (with a rubber gasket) to the pumping engine suction ferrule and discharge ferrule. Flanged distributor (item 2) has a flange on one end, as does the ferrule (item 1), and on the other side it has two inlets ended with internal fittings 133. The distributor is used (by screwing it down with a rubber gasket to the pumping engine suction ferrule) in those cases when drainage design provides for the usage of two suction header (system) lines. Flexible connector (item 3) is made of flexible reinforced PVC hose (D 110mm), approximately 2.5m in length with a tip with an outside fitting 133 (M-type – female end) on one end, and on the other an inside fitting 133. 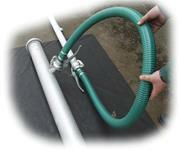 The hose is sealed at the ends with rubber inserts and fixed with metal bands. The connector is used to connect the wellpoint system suction header pipe to the pumping engine, or to alter the direction that the suction header and discharge pipe are lying. Suction header pipe IgE 81/32 (item 4) is made of D 133mm tube, 5 m in length, ending in fittings 133 (outside and inside). Ferrules used to connect wellpoints are spaced along the suction header every 1m. The suction header pipe is used to connect wellpoints to the pumping engine, and it is a negative pressure collecting line for all inlets/intakes. Through pipe (item 5) is made of D 133mm tube in two lengths (3 and 5 m) ending in fittings 133 (male and female). It is used to extend the wellpoint system suction header or to replace suction header pipe in these places, where no wellpoints are installed. Pipe bend 90° (item 6) is made of welded tube 133 sections, ending in fittings 133 (outside and inside). It is used to change suction header or discharge pipe direction by 90°. Flexible wellpoint 32 (item 7) is made of flexible and semi-transparent polyethylene tube 0 32x3.4mm, 7m in length, ending in a screened filter - length 0.3m, 0.6m or 1m. It is used to draw water from soil. Wellpoint gasket (item 8) is made of O-ring shaped rubber, size 0 23.5x7.7mm. It is used to ensure leaktight connection between the wellpoint and the suction header ferrule. Gasket 133 (item 9) is made of O-ring shaped rubber, size Æ 187x22mm. It is used to seal all suction header and jetting pipe 133 (item 16) joints with jetting hoses (item 15). Plug (item 10) is made of cut cone-shaped rubber, size 038/046x40 mm. It is designed to close (stop) suction header ferrules in the event that no wellpoint is used in a given location, or if it is put out of service due to emergency reasons. Outside stopper, end cap (item 11) consists of a capped outside fitting and a lever fastening. It is used to close suction header end. Moreover, it may be used to close off the pumping engine suction ferrule (when it is provided with ferrule or distributor) while checking its ability to generate negative pressure. Jetting pipe 50 (item 13) is made of D 50mm tube, ending on one side in an inside fitting, and used to install (set) wellpoints in soil without sand filling. Pipe length = 6 running metres. Jetting hose 50 (item 12) bezalin-type D 50mm, length 7.5 m, ending on one side in outside fitting 50, with bend and lever fastening, and on the other side with fire-fighting ferrule 52. 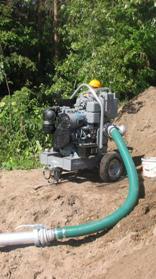 It is used to connect jetting pipe 50 and the water jetting pump. Gasket 50 (item 14) is made of O-ring shaped rubber. It is used to seal the joint between jetting pipe 50 and jetting hose 50. Jetting pipe 133 (item 16) is made of D 133mm tube, ending on one side in an inside fitting and pull and on the other side in tooth-shaped cuts, and is used to install (set) wellpoints in soil when it is required to use wellpoint sand filling. It is offered in two lengths (4.5 and 6.0 m) in order to facilitate wellpoint setting (jetting) at various depths. Jetting hose 75 (item 15) bezalin-type 0 75mm, length 7.5 m, ending on one side in fitting 133, with bend and lever fastening, and on the other side in fire-fighting ferrule 75. It is used to connect jetting pipe 133 and the water jetting pump. NOTE: It is acceptable to make jetting hoses using other pressure hose types (e.g. rubber, PVC, etc.). Suction header pipe IgE 81/63 (item 17) is made of D 133mm tube, length 5 m, ending in fittings 133 (outside and inside). Ferrules used to connect wellpoints are spaced along the suction header every 1m. It differs in ferrule type from the suction header in the IgE 81/32 system. An inside fitting/end for quick connection V51, has been used instead of a cylindrical one. Suction header is used to connect wellpoints to the pumping engine, and it is a negative pressure collecting line for all inlets/intakes. Flexible wellpoint 63 (item 18) is made of flexible and semi-transparent polyethylene tube 63x5.8mm, 6m in length, ending on one side in a 0.6m-long screened filter and on the other side in a M 51 tip. It is used to draw water from soil. Flexible connector 51 mm (item 19) is made of flexible reinforced PCV hose, D51, length of approximately 2.5 m, ending in two M 51 tips (quick connections). The hose is fixed with metal bands. The connector is used to couple wellpoint 63 with the suction header. Gasket for flexible connector 51 mm (item 20) - used in joints between connector 51 and suction header ferrule and wellpoint 63. Jetting pipe 108 (item 21) - made of D 108mm tube, ending on one side in an M-type fitting and pull, and is used to install and jet water into wellpoints in soil. § extend system sections; connect suction header pipes and system elements distant from each other. 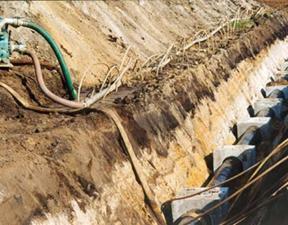 Discharge pipes shall be selected for each set, depending on the operating conditions of the system. - as individual elements, according to specific orders. Contractual wellpoint system sets are shown below. The system elements are available to order in sets or as individual elements. When selecting elements, we may take into account existing or expected system operating conditions. 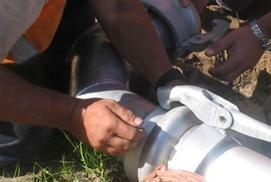 It is also possible to renovate system elements such as wellpoints or suction header pipes. X means that an element with the specified diameter is available. Another available variant of the IgE wellpoint system is one in which certain elements (suction header pipes and bends) are made of modified HDPE polyethylene. The range of operation for a system like that is the same as in the case of fully aluminium systems. It is recommended that polyethylene elements be stored either under a roof or cover. § large diameter D 133 mm. with varying lengths in order to facilitate jetting into different depths. Jetting pipe 51 (item 13) is used to install wellpoints in soils which do not require filtration sand filling to be used, and jetting pipe 133 (item 16) is applied to jetting wellpoints in cases when it is necessary to use sand filling. § homogeneous dusty soils, up to a height of about 0.5 m above upper filter edge (in practice 2 buckets of sand filling). d50 = average soil grain coarseness. Wellpoints shall be installed every 1m along a predetermined line, ensuring that all filters within the indicated wellpoint line (connected to a single pump) are at one level.A team of 4-5 trained workers is required to install wellpoints at the construction site. 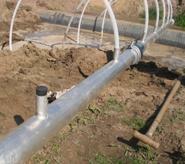 § when water flows out of the jetting pipe, remove it from the support and lower it to the ground. Note: Correct lowering (penetration into the ground) of jetting pipe is characterised by a steady water outflow around the pipe. This is achieved by properly manoeuvring the jetting pipe (vertical and circular movements). § Disconnect jetting hose from jetting pipe. Note: If water flows out of jetting pipe after jetting hose has been disconnected, keep lifting the pipe slowly until water stops flowing out. § keep holding wellpoint (pushing it gently into the pipe) and move the pipe vertically a few times (lift and lower it by approximately 1m). When the lifted pipe stops drawing out the wellpoint from soil, completely remove the casing pipe. 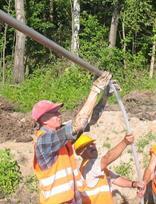 § keep holding wellpoint (pushing it gently into the pipe) and withdraw the jetting pipe from soil. 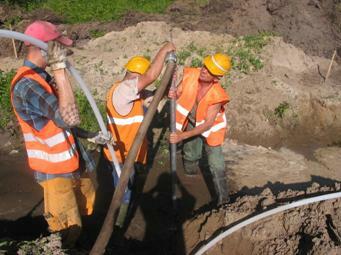 Note: 1) When withdrawing the jetting pipe, proceed carefully so as not to pull out the wellpoint from the sand filling. 2) Jetting pipe 133 shall be held by a crane during water jetting and when it is pulled out (rope hooked over a special grip on the pipe), or manually using loops made of hemp ropes or V-belts. 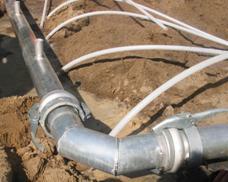 The wellpoint system suction header pipe shall be placed slightly higher than the pump or horizontally at an approximate distance of 0.5m from the line of already driven-in wellpoints directly on levelled ground (ground surface, trench/excavation bench) or on wooden supports placed near section joints. Suction header pipe sections shall be laid with tips/ends with the outside fitting (lever fastening) turned towards the pumping engine. All header pipe ferrules used to make connections with wellpoints must face up. Assembly of the suction header pipe line (individual header pipe sections, flexible connectors, bends, stoppers) involves putting ends together, placing the hook and closing the lever. 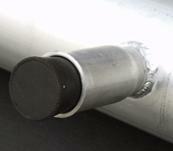 Use flexible connector (item 3 on the list) or bends (item 6 on the list) in order to change suction header pipe direction. Use through pipes (item 5 on the list) in order to extend suction header pipe in places where wellpoints are not required. The header pipe end shall be closed with a stopper/plug (item 11 on the list). 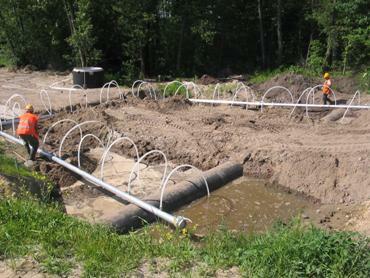 Wellpoints installed (set) in soil shall be connected to the suction header pipe using O-ring-type rubber gaskets (item 8 on the list). This requires the above-mentioned gaskets to be put onto wellpoint ends and moved to a distance of 40-50 mm from wellpoint end. Then, the wellpoint with the gasket shall be driven in perpendicularly into header pipe ferrules. Wellpoints shall be connected to the suction header pipe, ensuring that the height of all wellpoint bends over the header pipe is as low as possible and identical. In the case of shallowly-set wellpoints, this may be achieved by moving the header pipe in relation to already driven-in wellpoints. When there are less wellpoints used than the number of ferrules on the header pipe, free ferrules shall be closed with rubber plugs (item 10 on the list). Flexible connectors (item 3 in the list) and flanged ferrules (item 1 in the list) are used to connect the assembled IgE-81 wellpoint system to the pumping engine. It is recommended that the initial wellpoint system operation period (from activation of the pumping engine until the intended depression has been obtained) should be supervised by a specialist. This operation period is used to verify the designed wellpoint system working conditions (wellpoint setting/foundation depth, sand filling, number of wellpoints connected to a single pumping engine, etc. ), and to introduce possible additions or modifications. Further wellpoint system operation and work control shall be supervised by trained employees. Semi-transparent wellpoints and monitoring-measurement equipment (as vacuum meters, piezometers, water meters) facilitate system work control. 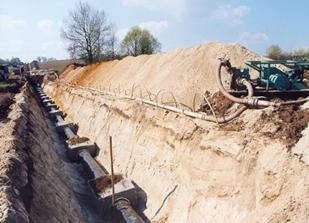 The drainage system shall include continuous water pumping. Water from the trench should be removed to a distance higher than the depression sink range. § remove (take out) all rubber gaskets from joints. After disassembly, all wellpoint system elements shall be washed with water, cleaned, and protected before further use. When transporting the system, a truck with min. 5m-long open load-carrying body is required (due to the length of the elements). Suction header pipes and through pipes shall be stacked in piles (layers shall be interleaved with boards), or laid crosswise in layers (at a 90°angle). All rubber elements (gaskets, plugs) shall be kept in dark and cool places (preferably at a temperature of about 6°C). Wellpoint screens shall be protected from excessive exposure to sunlight, for example by covering and shading them. Jetting hoses, flexible connectors, and small elements shall be stored under a cover. Wellpoint system elements do not require any extra maintenance operations. Note: Proceed with special care during disassembly, cleaning, transport, and storage of the system elements so as not to damage surfaces which contact rubber gaskets. When using wellpoint systems, follow the same industrial safety regulations as those applicable for construction (earthworks, foundation works, etc.) and transportation. 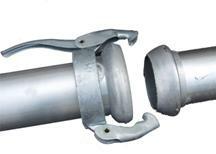 § secure wellpoint system suction header pipe stability throughout operation period. While operating the drainage system and wellpoint jetting, the appropriate industrial safety regulations shall be applied regarding the operation of pumps, electric motors, and combustion engines, etc. Be careful when handling the joint clamping lever during system installation and removal and while jetting wellpoints. § Knowledge of rules regarding wellpoint drainage and observance of these instructions are the basic conditions for obtaining proper drainage results. § Correct operation and maintenance of the system will ensure its efficient and long-lasting functioning. § We wish you efficient work with the equipment that we have designed, and thank you in advance for sending any of your comments and observations.